Snuggle up this autumn with a slice of spiced fig and walnut loaf cake and a mug of something hot! You may have noticed that I am loaf cake obsessed right now. The last 3 recipes on the blog (including this one) have been simple cake recipes that are baked in a loaf pan. Why? Well life is just too short to be stressing about even layers, towering tiers and fancy decoration. We’ve been really busy this last month and so I’ve been sticking to quick and easy cake recipes that let me get my cake fix without taking too much effort. 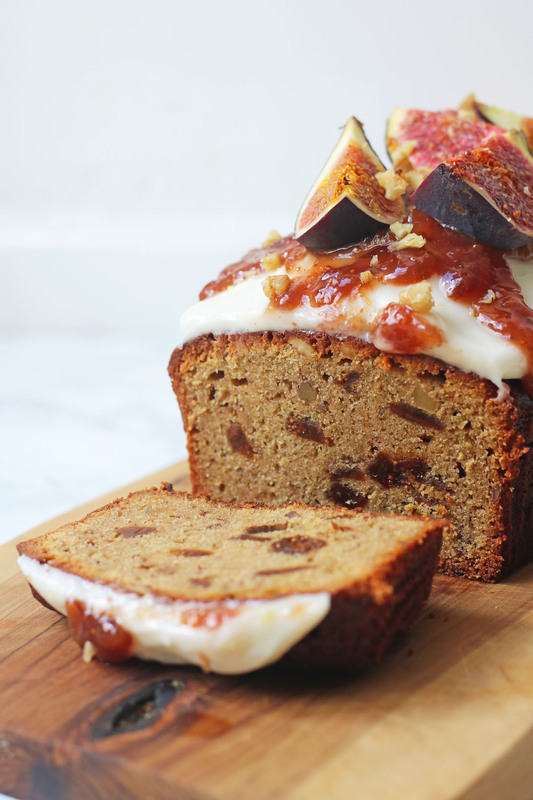 I think you’ll agree that although this spiced fig loaf cake is a lot easier to bake and decorate than my usual layer cake recipes, it still looks delicious! I made this cake for Enfield Cake Club a few weeks ago and it went down a treat! 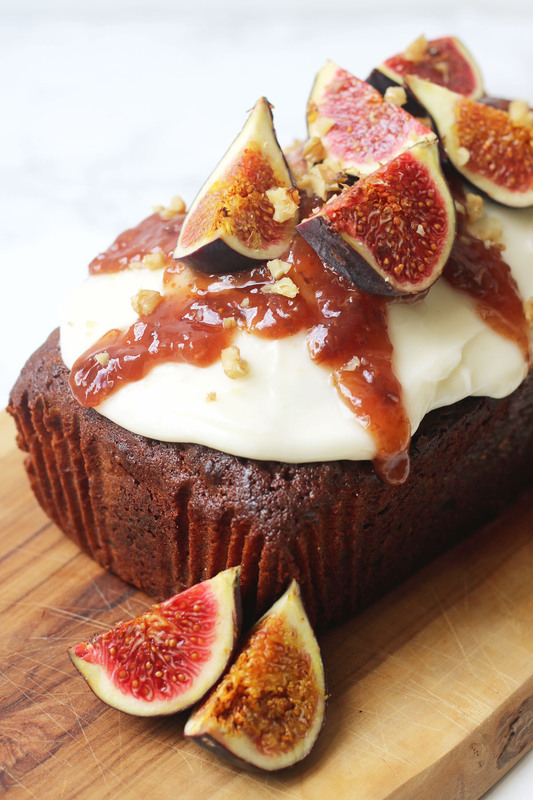 If the thought of decorating a cake usually stresses you out then you’ll be pleased to know that to get the “look” for this cake you just have to pile fresh figs on top of lashing of cream cheese frosting, then drizzle over a few spoons of fig preserve. Just chuck it all on and it will look awesome, I promise. I love fresh figs; they are one of my favourite fruits. The second I see them in stores I end up buying a tonne and then wondering what on earth to do with them. They are delicious for breakfast, served with a cheese platter, on an open sandwich, roasted low in the oven, or even turned into a chutney or jam! They are also delicious in a cake. What takes them to the next level in this particular cake is that they are combined with walnuts and warming spices. I raided the cupboard for this recipe, adding all spice, nutmeg and cinnamon to the batter. For a true taste of autumn you have to have some spice. Although the cake is served cold you can count on the spices to warm you up on a cold day. Although I’ve used walnuts you could swap them out for hazelnuts too. Pre-heat your oven to 180C / gas mark 4 and line a loaf tin with grease proof paper or a loaf liner. In a large mixing bowl, beat together the butter and light brown sugar until soft and creamy. Next, beat in the eggs one at a time until the batter is pale, fluffy and has doubled in volume. Add in the fig preserve and make sure it is mixed well. Fold all of the self-raising flour and spices into the wet cake batter mix. When the flour has almost completely been combined, add in the chopped dried fig and walnut. Avoid over mixing and stop as soon as all of the flour is mixed in and the fig and walnuts are well dispersed throughout the batter. Pour into your lined loaf tin and bake in the oven for 45 minutes - 1 hour or until the sponge is springy and a skewer placed in the centre of the cake comes out clean. (See Note 1). Leave the cake tool in the tin for 10 minutes before turning out onto a wire rack to cool completely. Using an electric whisk, beat together the butter, half of the icing sugar and the seeds from the vanilla pod until smooth and creamy. Next, beat in the cream cheese by hand until the frosting is smooth and creamy but thick enough to spread. Spread the cream cheese frosting over the top of the cake. Place quartered, fresh figs on top of the frosting then spoon over the fig preserve that has been thinned with a little hot water. To finish, sprinkle over a handful of chopped walnuts. Note 1: if the cake is not cooked after 45 minutes, avoid the cake catching by covering with some grease proof paper or tin foil. If you like figs then you will love these other fig recipes! I do love loaf cakes. They are so tempting and tasty. That one looks gorgeous! Shared! I love the versatility of loaf cakes too – So many flavour combinations possible from one little tin. I rarely bake with figs but your recipe has made me curious. Those walnuts sound like a winning combination too.